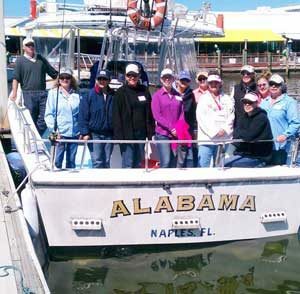 Today’s fishing charter was graduates from the ” Ladies Lets Go Fishing” seminar that was held in Naples this weekend. Several local charter captains made presentations to the gals showing them various techniques of tackle and styles of fishing. For graduation they all chose to apply their new found knowledge on the waters with several Naples FL charter boat operators. The eleven ladies shown with Captain Kraig Dafcik decided to try offshore fishing where they caught lots of grouper and various types of snapper. A good time was had by all and many promise to return to Naples soon with their families for private charters.